A UC Irvine law student works with low-income clients to prepare Lawful Permanent Resident applications as part of the Permanency Project. Pursuing public service just got a lot easier for University of California law school students. UC President Janet Napolitano today (April 13) announced a first-of-its-kind fellowship program to help UC law school students pursue careers in public interest law. The President’s Public Service Law Fellowship program will award $4.5 million annually to promising law students at UC Berkeley, UC Davis, UC Irvine and UCLA. The funding will make postgraduate work and summer positions more accessible for students who want to pursue public interest legal careers but might otherwise – out of financial need – seek private sector jobs. The postgraduate fellowships will provide $45,000 for graduates entering public service, plus an additional $2,500 to help defray bar-related costs. The summer fellowships provide each fellow between $4,000 to $4,500 to subsidize summer public interest law jobs. In all, the program is expected to provide 424 summer fellowships and 58 postgraduate fellowships for students at the four top-tier law schools. As part of the fellowship, UC will host an annual conference that brings together legal experts from around the country and across UC to network and share expertise on selected public service law topics. The event, which will be held each year at a different UC law school, will give current and past fellows an opportunity to build a supportive network of public interest lawyers across California and the nation, Napolitano said. The fellowship program will also help make UC a destination for top law school students who are committed to practicing public interest law, said Erwin Chemerinsky, dean of UC Irvine School of Law. 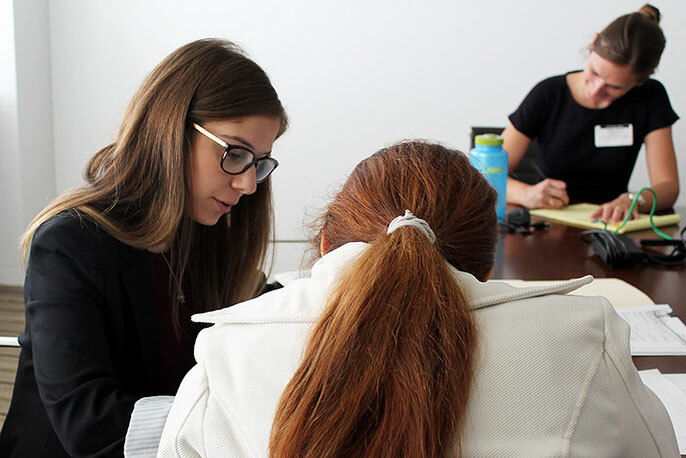 UC law schools already have a long-standing commitment to public interest law; most students participate in legal clinics that give them hands-on experience serving a variety of clients and causes that have historically lacked access to legal representation. At UC Irvine, for example, law students have worked with Hermosa Beach residents to fight offshore oil drilling. At UCLA, law students help homeless military veterans with a variety of legal issues. And the immigration clinic at UC Davis provides high-quality legal assistance to undocumented students at UC, among its other casework. Napolitano, who earned a law degree from the University of Virginia, announced the new program during a lunchtime event at UCLA Law. She told the assembled crowd that her own career in the public sphere had been extraordinarily rewarding. Postgraduate Public Service Law Fellowships: The program will provide $45,000 for law school graduates entering public service, plus an additional $2,500 to help defray bar-related costs. Summer Public Service Law Fellowships: The program will provide $4,500 for second-year students and $4,000 for first-year students pursuing summer public service law positions. UC Washington Program: The program will provide funding to enable UC law students to participate in the UC Washington Program — a vital UC program that gives students real-world public service experience in the nation’s capital. UC Law Public Service Network: Through the program, fellows will have the opportunity to build relationships with other fellows at their school and across the system, creating a new network of UC public service lawyers who will support each other and future generations of UC law graduates.